One of the airplanes featured in a 300-square-foot mural that two Belfast artists have completed in a hangar at Belfast Municipal Airport can be seen in this August 2014 file photo. BELFAST, Maine — Just about every day, planes fly in and out of the Belfast Municipal Airport, which local officials believe to be an important part of the area economy — even though many might not know it even exists. That’s why Duke Tomlin of the Belfast Experimental Aircraft Association is really hoping for a big turnout for the airport’s first-ever open house and fly-in, which will be held 7:30 a.m.-3 p.m. Saturday, Sept. 19. He said the event will feature home-built airplanes, helicopter rides and pilots who have flown in from around New England to participate. There will be food trucks, a $5 breakfast and other vendors. Fly-ins are similar to car or motorcycle shows, he said, and are fun ways for people who share the same interest in aviation to get together and compare notes. 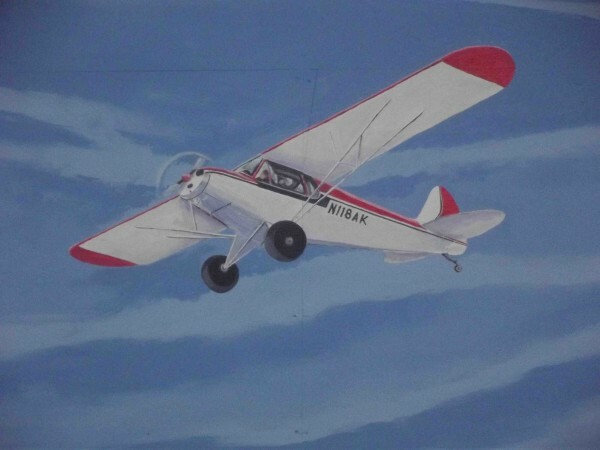 The family-friendly fly-in will include the unveiling of an aviation mural by local artists Dave Hurley and Russell Kahn, displays by various aviation public service organizations, and the chance to learn about how to become a pilot and how to build your own airplane. “It should be a nice day, with lots of interesting things to see,” Tomlin said. The rain date for the event is Sunday, Sept. 20, and the Belfast Municipal Airport is located at Little River Drive in Belfast.